Trail running shoes are designed to be more durable than track running shoes, as well as providing you with more support to cope with the diverse terrains. Unlike track running, it is likely that on a trail run you could cover multiple surfaces in one session. From grass, mud, rocks, and sand, it is important for trail runners to get use the perfect shoe for the more challenging terrains. A lightweight trainer with an enhanced grip on technical trails is integral to achieve the best performance and to protect you against the harsher impact. It can take a little more consideration to decide which trail running shoe to buy because their features are specific to different kinds of trails compared to road trainers which don’t need to have so many features. You should always make sure your trail running shoes fit well, as well as considering the conditions you will be running in to pick the ones that will be best suited to your needs. 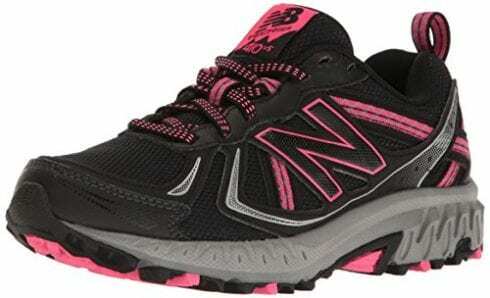 Related: Best Men’s Running Shoes & Running footwear made for women. View the Best Trail Running Shoes, Below. What to look for in Trail Running Shoes? How to Wash Trail Running Shoes? Deciding which trail running shoes will be made easy after reading this list of the best ones available and comparing their features. 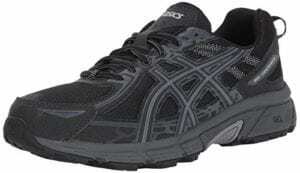 Asics Gel-Venture 6 trail running shoes for men are made with a rearfoot GEL Cushioning System that absorbs shock impact for a smooth transition to midstance. The sock liner can be removed to be replaced with a medical orthotic if needed, and the Asics High Abrasion Rubber (AHAR) outsole is placed in critical areas for increased durability. The sole is also made from gum rubber for the best performance results, and the outer material is synthetic for flexibility and comfort. They are suitable for all kinds of terrain because of their trail specific outer sole which is designed with reversed lugs that provide both up and downhill traction for increased stability. 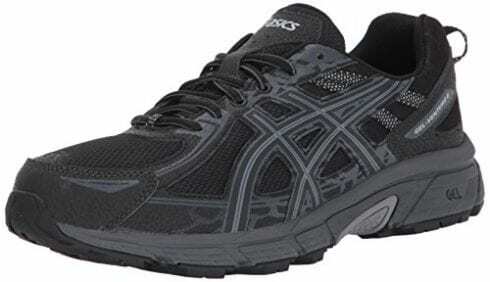 Asics trail running shoes are made from high-quality materials for the best comfort on long trail runs. 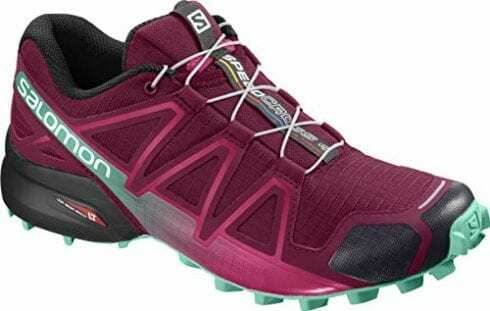 Salomon Men’s Speedcross 4 Trail running shoes come in a wide selection of bright colors. They are made with gum rubber for enhanced grip and comfort against impact. The Gore-Tex membrane that coats the running shoes offers lightweight and waterproof protection that will keep you dry while out on difficult terrains. The shoe only weighs 260-300 grams to give you the best performance without weighing you down, providing you with comfort during long training sessions. The laces adjust quickly and safely with the Quicklace system that allows you to tighten your laces with the most convenience without worrying about knots. The Sensifit system molds to your foot perfectly which provides the securest and most comfortable fit. 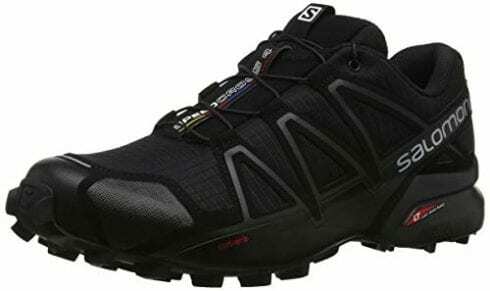 The Salomon Speedcross trail running shoes are made with a Wet Traction Contagrip sole that is created from smooth and resistant rubber for the best possible traction and support for running on difficult terrains and wet surfaces. The Speedcross 4 are perfect for use in wet conditions with their Gore-Tex waterproofing and soles especially designed for providing traction on wet surfaces. New Balance 510v4’s for men are diverse, equipped with dual-use AT Tread for both on and off-road running, meaning you can take these running shoes from track to trail. The Toe Protect adds superior durability for those rough terrains, and the outer leather material will be durable against harsh environments. The ABZORB cushioning in these running shoes is a responsive cushioning that helps to absorb any shock as you move across different terrains. The AT Tread outer sole is designed for better grip and to reduce impact, with an ultra-soft New Balance comfort insert innersole to increase your performance for longer. The ACTEVA midsole is a technology created by New Balance that provides lightness and durability and is made from foam for comfort. These running shoes are perfect for those who enjoy both track and trail running and are suitable for both which means you only need one pair of running shoes. 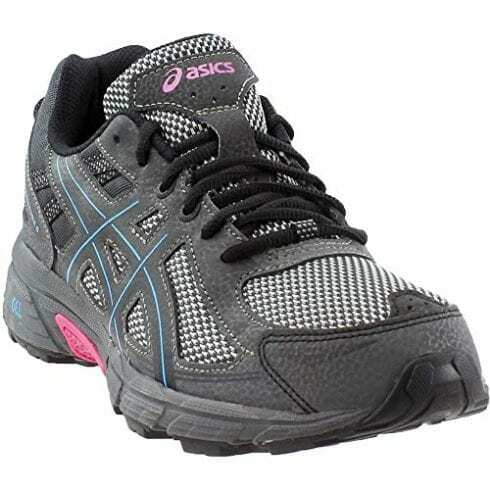 Asics Gel-Venture 6 for women are designed for both fitness and cross-training and come in a selection of colors. They are made with GEL cushioning on the heel to absorb shock and impact, also featuring a hard sole that is suitable for all kinds of terrain meaning you won’t need to restrict your running to certain areas. This means that they are equipped to create the best performance on surfaces such as rocks, sand, and gravel. The one-piece sole features multi-directional fins for heightened durability and traction on these surfaces with the newly designed midsole providing the best stability. The stitched toe cap will increase the durability of your female running shoes and protect them against uneven terrains. The 10mm differential keeps your foot in perfect position for running, and they are light enough to allow you to run without being weighed down. 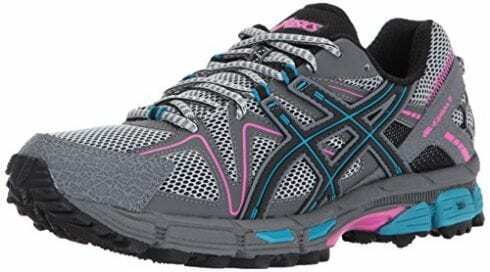 These Asics Gel Venture 6 trail shoes for women are perfect for any terrain meaning you will be able to go anywhere and still get the best grip and protection. 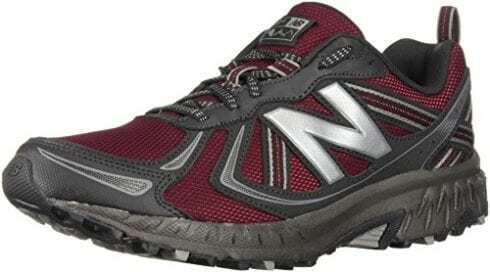 The Mt410v5 men's running shoes from New Balance are specifically designed for the trail as well as the road. The upper is made from mesh which makes it breathable and lightweight while still giving protection, which is suitable for fast running in moderate climates. The dual-purpose AT Tread sole combines trail and road lug designs so you can run on both road surfaces and high-alpine terrain. They are using with an athletic design with style in mind, and the performance insert increases comfort while maintaining stability. Stability is even further increased with the rubber wrap, and the Acteva technology is 24% lighter than other New Balance’s running shoes that use the standard compression molded foam which gives optimal compression set properties for the best results to keep you on the move for longer. These New Balance running shoes are perfect for on, and off-road terrains and are both lightweight and breathable which is great for performance in warmer climates. 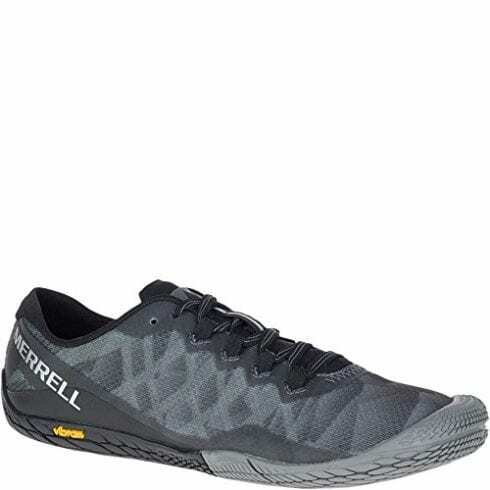 The dynamic and lightweight Merrell Trail Glove 4 running shoes for men are streamline and lightweight. Made from a breathable mesh upper creates a comfortable environment for your feet, keeping them both cool and dry. The TPU overlays offer support in the most needed areas, and the mesh lining is equipped with M-Select Fresh mesh for improved ventilation and odor control. TrailProtect technology offers additional support when running off-road so you don’t need to worry about not being protected against certain surfaces you are running on. The Vibram Outsole provides enhanced grip on various terrains and in all weather conditions. These barefoot shoes have a sock-like feel for a locked-down fit to keep your feet secure and comfortable. These Merrell men's trail running shoes are perfect for all weather conditions meaning you can wear them all year round while being light and breathable for enhanced flexibility and performance. The New Balance Women’s W410v5 are fitted with a rugged rubber sole for the best grip and traction on uneven terrains. They come with protective overlays for durability on those long trails, stripped ghille lacing and heel loop to keep your feet secure and allow you to take on and off quickly. The plush padded collar gives support and comfort for longer, and the XLT performance footbed creates the best comfort for your feet when running on hard surfaces. The AT Tread all-terrain outer sole will prepare you for coping with various surfaces, providing grip and traction for the best performance. This New Balance trail running shoes are the female version of the New Balance trail running shoes for men with all the benefits of both on and off-road performance. The Salomon Women’s Speedcross 4 trail running shoes are designed with an aggressive grip for the best possible protection and performance on difficult terrains. The fourth generation of their famous Speedcross lug pattern is ideal for soft, technical trails and the Sensifit technology with the Quicklace feature allow for optimum comfort and ease, always making sure your feet are secure. They also feature endoFit technology which will ensure your feet are being looked after a while you train for longer. The outer sole uses wet traction Contagrip for best results on wet surfaces, and the mesh lining is both waterproof and keeps debris out making them suitable for all weather conditions. They have molded EVA midsoles for lightweight comfort and protection against impact. These women's trail running shoes offer the best results for difficult terrains with their extreme grip and comfortable design to support you. The Asics Gel-Kahana 8 for women contain a rear foot gel cushioning system for added support and protection against impact from hard surfaces. They reduce shock and allow a smooth transition to midstance. Their SpEVA midsole is made from a material that improves bounce-back characteristics when running and decreases the breakdown of the midsole. The DuoMax Support system is a dual density midsole technology that is designed to increase support and stability, specifically positioned in place for the best results. The Gel-Kahana 8 train running shoes feature a Trussic system that reduces the weight of the sole unit while keeping the structural integrity of the shoe for durability. The outer sole is designed specifically for trail running, made with reversed lugs to provide both up and downhill traction on all types of terrain, so you don't need to sacrifice speed or performance because of the road surface. The Asics Gel-Kahana 8 trail running shoes for women are equipped to give you the optimum grip and comfort for longer with their array of advanced technologies. The Merrell Women’s Vapor Glove 3 running shoes are made from mesh for an ultra-lightweight experience, making them ideal for flexibility and fast performance. The mesh lining is breathable to keep your feet at a comfortable temperature and mean they are suitable for warmer climates. Their gum rubber soles will provide excellent grip and are designed for resilience, featuring a trail pad for increased durability underfoot to defer the general wear and tear that comes from regular use. The barefoot, sock-like feel provides a comfortable locked-down fit to feel as if they are barely noticeable which gives you the freedom to perform at the best of your ability. The Vibram sole has almost no ground-to-foot separation that increases the sock-like feel. They are not only perfect for trail running, but are also great for free running, going to the gym, training, and outdoor obstacle races. These trail running shoes are light and minimal but are made with quality materials for durability and to keep your feet comfortable and cool whatever you wear them for. These types of running shoes are designed for dealing with track and trail running. This is useful if you don’t want to buy multiple sets of shoes for each kind of training. 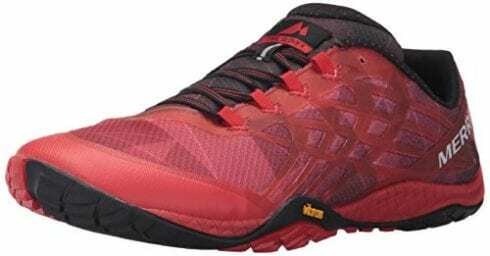 They are more similar to road shoes but have extra cushioning to remain comfortable on harder terrains and a more aggressive outer sole for added traction for trails. 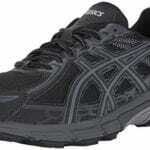 They are usually made from stronger materials than road running shoes for increased durability in harsher environments. This kind of shoe is better for those who will be mostly doing road running and hard packed trails. The downside of selecting running shoes designed for on and off-road training is that they won’t be designed to best prepare you for either surface. 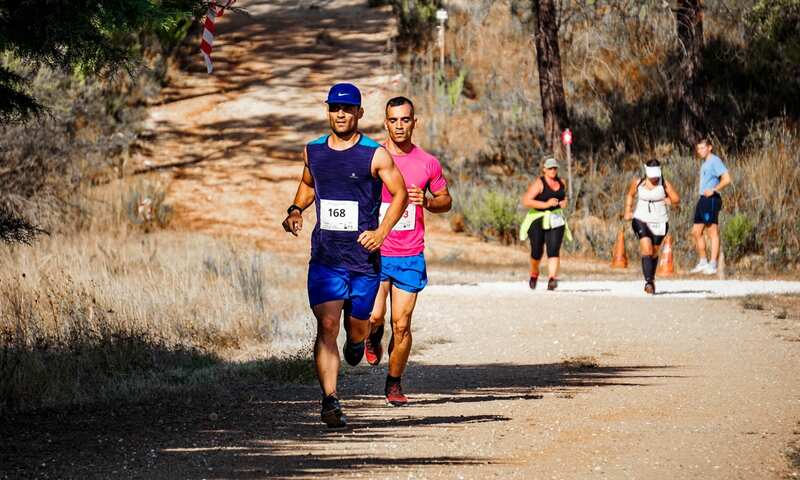 If you know you will be doing mostly trail running on soft trails, it would be better to choose a pair of running shoes that are specially designed for this type of running as they will have the best design to support and provide traction on those kinds of surfaces. They will have a better grip which will allow you to increase your performance and have less cushioning for soft trails which will mean they are lighter, making them easier to run in muddy conditions. It is important to choose a train running shoe that will give you enough grip when on soft trails that are often muddy and wet. Some trail running shoes are better equipped to deal with these conditions than others. Make sure you know what kind of trails you will be going on before you buy your running shoes, so you know how much grip you will need. Some trail running shoes have anti-debris features which mean they won’t let anything inside the shoe. This can be valuable, so you don’t need to keep stopping and emptying your shoes on a soft trail run because they have become uncomfortable. This feature will help to protect your running shoes and increase their durability. Trail running means you will be facing more rugged terrain than track running which means your shoes will need to be made out of stronger materials. This will depend on the kind of climate you will be running in. Some trail running shoes are more waterproof than others which will be better for wetter climates, and some are made from lighter materials such as mesh, or incorporate anti-odor technology which is more breathable, helping to keep your feet cool in warmer environments. Waterproof shoes can also add warmth which is better for winter. Because the nature of trail running means you will be covering areas with more difficult and often diverse terrain, some trail running shoes offer different kinds of support than others. You will want the best protection you can afford, which will look after your feet and legs. Look out for cushioned soles and shock absorbers. The upper part of the shoe also will need more protection from the elements, so make sure the shoes are made out of quality materials. Ideally, you will want to look for a trail running shoe that is lightweight, waterproof and breathable while providing you with enough grip for the kind of trails you will be running, and the most protection from the impact of uneven and diverse surfaces. For the most comfortable fit, your trail running shoes should be snug around the heel to prevent slippage, while there is room in the front for movement. 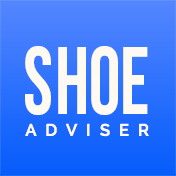 The front of the shoe should sit a fingers width away from your toes to give you enough room to be comfortable. Length, width and arch shape are also factors to consider when deciding which trail running shoes to buy. 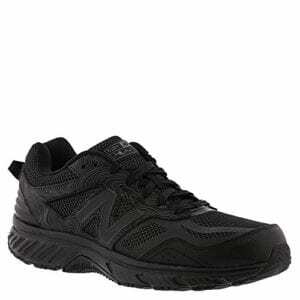 Under armour running shoes tend to be a popular choice for comfort. To clean your trail running shoes, you will need to remove the insole. Surface dirt can be cleaned off with a brush when dry or using warm water. If the shoes have Gore-Tex membrane, you won’t be able to rinse the interiors. Don’t use detergent as it can remove adhesives form the shoes. 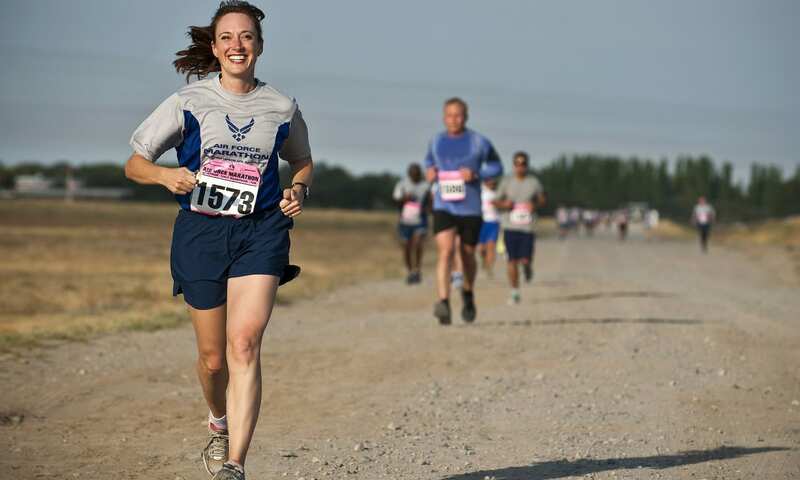 Trail running shoes offer a different type of protection to other running shoes. A shoe designed for roads will break down faster than if used on trails. Lugs are part of the sole that creates grip. A shoe with larger lugs will create more traction on muddy trails compared to a shoe that is designed for less technical terrain which will have smaller ones. We hope you enjoyed our article on "10 Best Trail Running Shoes in 2019", if so, please share and rate it.